Want to download Felgo for another operating system? If you already installed Qt 5 on your system, install Felgo in parallel using our installer, to solve Qt and Qt Creator version compatibility issues. The Felgo and Qt installation will work side-by-side in two different directories. Windows: No additional steps required before installation. macOS: Download and install Xcode from the App Store or developer.apple.com/xcode/. See here for detailed installation instructions for Ubuntu, Debian, Fedora, CentOS and Arch Linux. This link also contains tips for other Linux distributions, how to set symlinks and how to create a launcher for Felgo. To protect your account from unauthorized access, it is locked after three failed login attempts. Please contact us to unlock your account if you entered your E-mail or password incorrectly three times. 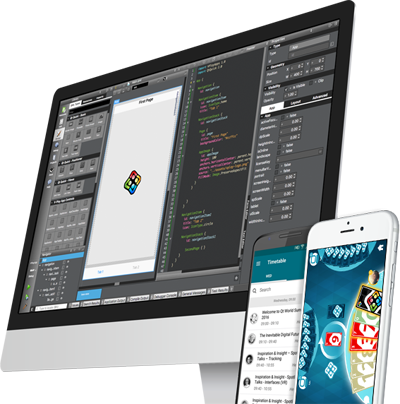 Learn App Development: The above Udemy online course normally costs 129,- €, but is FREE for all Felgo developers! You can find the coupon code in the first welcome email you received after sign-up. Learn Game Development: This video guides you through the basics of developing cross-platform games with the Felgo SDK. Learn how to develop feature-rich, cross-platform apps with a native look and feel. Learn the essential basics of creating cross-platform games with Felgo. We gathered the most important resources to help you developing your own Game or App. Go ahead and check out our getting started tutorials in the documentation. If you run into any issue, just post a question to our support forums, we are here to help. Sample Launcher Quickly test all open-source demos & examples of the Felgo SDK. Documentation Find demos & tutorials and browse through the Felgo API. Support Forums Get help from the developer community and Felgo Team members. We also announce new updates on our social media channels, don’t forget to follow us on Twitter and like us on Facebook.